I’ve been updating my painting blog lately. Mostly because people keep asking me if I have a website, and if I gave them this one, I’m guessing my phone would pretty much quit ringing. Anyway, I have already scheduled several posts and am working on some more. One of my favorite nurseries is one I did for Grace Presbyterian Church. I painted three rooms, each with a different bible theme. 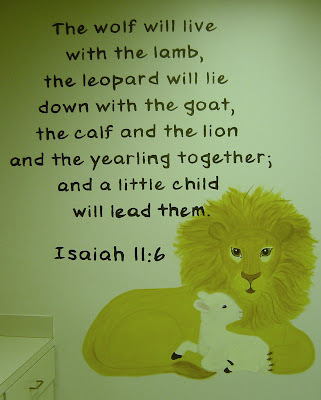 I knew I wanted the infant nursery to have baby animals, so I decided to use Isaiah 11:6. I will post all the pictures next Sunday over on Stuff I Painted. A shoot will come up from the stump of Jesse; from his roots a Branch will bear fruit. The Spirit of the LORD will rest on him—the Spirit of wisdom and of understanding, the Spirit of counsel and of power, the Spirit of knowledge and of the fear of the LORD – and he will delight in the fear of the LORD. He will strike the earth with the rod of his mouth; with the breath of his lips he will slay the wicked. Righteousness will be his belt and faithfulness the sash around his waist. The infant will play near the hole of the cobra, and the young child put his hand into the viper’s nest. They will neither harm nor destroy on all my holy mountain, for the earth will be full of the knowledge of the LORD as the waters cover the sea. I love this scripture because rather than describing Jesus as coming from the Kingdom of David, it uses the more humble description of “the stump of Jesse”. It also tells me that there will come a time when wickedness and evil will be destroyed; that Love really does win. Feel free to expound on the commentary of this portion of scripture in the comments section. I’d love to read your thoughts on it. Happy Sunday, y’all!